The FCC’s chronic refusal to answer a few simple questions about an alleged security incident that supposedly wrecked its comment system has reached its final form. Despite being pressed for a straightforward response by a half-dozen lawmakers over the past year, the agency’s Republican chairman, like a malingering chicken, always finds a way to dodge the questions and shirk accountability. The latest example only happens to be the most laughable so far. At this week’s FCC oversight hearing, Pai was questioned by Rep. Debbie Dingell, Democrat of Michigan, over the agency’s failure to respond to repeated inquiries dating back to July 2017. Dingell and a colleague, Rep. Jerry McNerney of California, are among those who have been pressing Pai to explain and elaborate further on his claim that the FCC was struck by multiple denial-of-service attacks on May 7, 2017, just as—coincidentally, the agency would have us believe—comedian John Oliver was directing millions of viewers of his HBO show Last Week Tonight to rush the agency’s website. As Gizmodo was first to report, the senior IT official who first announced the attacks this May had also previously leaked false information to reporters about similar comment system issues in 2014. Contradicting the findings of the FCC’s own security professionals, the official leaked that the agency’s system had been overrun by hackers attempting to cripple the FCC’s ability to gather public comments during the height of the 2014 net neutrality debate—a crucial part of the rulemaking process. Although under the Obama-appointed chairman, Tom Wheeler, the FCC never officially declared that a cyberattack occurred in 2014—because it didn’t, as Wheeler reaffirmed this June—Pai’s FCC dreamt up its own version of events last year. Suddenly the fake attack was canon; it was shared with the Wall Street Journal, which happily reported it; and a new reason was concocted to explain away why the baseless 2014 “attack” had never been reported via official channels before: Wheeler had wanted it kept secret. Mainly, the bogus claim that the agency had been attacked three years ago was used to bolster the much newer claim that it had been attacked “again” last year. As Gizmodo reported out the trail of inconsistencies and dubious leaks, the interests of both House and Senate lawmakers was piqued. And while answers were demanded, every effort to get at the truth has been stymied by Pai and the officials under him. The FCC’s claims are currently under investigation by its own inspector general, as well as the General Accountability Office, Congress’ watchdog. Dingell was able to press Pai in person this week, however, during a televised oversight hearing. But in response to having a long list of times Dingell and others had requested information from him read aloud, Pai declined to answer any questions, saying he is legally forbidden from discussing the matter, at least until he receives a formal letter from the Oversight Committee itself. “Would you agree, Chairman Pai, that there’s something wrong when members of committee tasked with oversight of the FCC learn about issues from the press when we’ve been asking about them for more than a year?” Dingell asked. The Republicans in control of the committee Pai referred to have not, so far, shared Dingell’s interest in digging further into the FCC’s cyberattack claims. These are the same Republicans who, when the 115th Congress kicked off, committed to holding an FCC oversight hearing every quarter. So far, they’ve gotten around to three. Pai leads what has become one of the least transparent agencies under the Trump administration. It fiercely combats the disclosure of records under the Freedom of Information Act (FOIA), meticulously applying exemptions to internal documents and redacting them under the broadest and most unreasonable interpretation of the law possible. In a recent batch of over 1,000 pages of records released under FOIA, nearly every internal email was blacked out citing the deliberative process privilege, a provision carved out solely to allow agencies to withhold records that, if made public, would hinder its ability to host frank discussions on policy matters in the future. Last winter, the FCC used this same privilege to withhold records related to jokes that Pai had told at a public event in December. 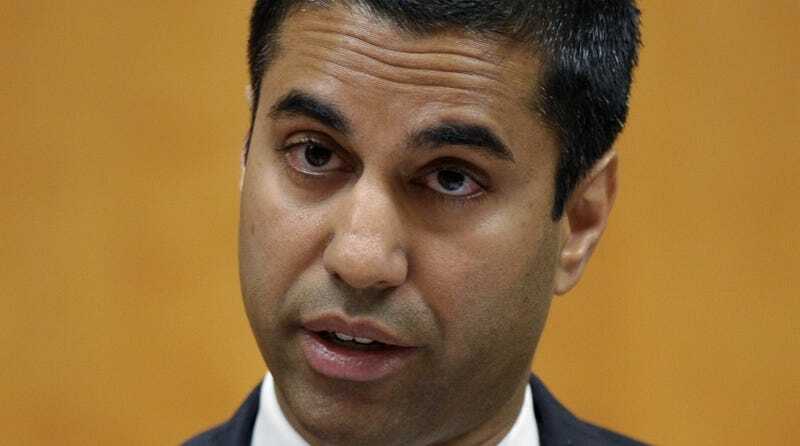 In May, a dozen Democrats charged with FCC oversight accused Pai of ducking their questions, further admonishing him over what they pointedly described as a “lack of candor.” The lawmakers wrote that Pai had either ignored or inadequately responded to more than two dozen letters containing essential oversight questions, the earliest of which was dated back to March 2017.